by Rupert T. Gould in 1934. Finally, I come to the most plausible theory of all - one which, at present, holds the field. That is, that the "Loch Ness monster" belongs to the Pinnepedia - and is, in all likelihood, a large grey seal. The leading exponent of this view is Mr. M.A.C. Hinton, Deputy-keeper of Zoology at the Natural History Museum, South Kensington. Other authorities, such as Dr C.H. Townsend (Director of the New York Aquarium), Mr. R. Elmhirst (Superintendent of the Marine Biological Station, Millport), and Mr. T.H. Gillespie (Secretary of the Scottish Zoological Society) have also expressed the same conclusion. Furthermore, since the return of the Daily Mail "mission", that paper has (until recently) lost no reasonable opportunity of advocating the seal theory - while a short note in Nature ( 13.i.34) regards the "mystery" as finally explained on this basis. It is undoubtedly true that there are many points in favour of the supposition that X is some species of seal: presumably, a grey seal - since that is the largest type known to occur on the Scottish coast. Although such seals have never been seen, hitherto, in Loch Ness there is no question that one could find its way thither (overland, if necessary) see footnote - and so unusual an event might easily postpone its identification. A grey seal has a long and surprisingly extensible neck; it swims with a paddling action; its colour fits the bill; and there is nothing surprising in its being seen on the shore of the loch, or crossing a road." The footnote reads "Seal have been encountered in the most unlikely places - some years ago, one was found halfway up a Scottish mountain, and miles from the sea. Grey seal have made 30-mile journeys over rough country. This picture is, I think, the first photograph of a grey seal taken in Loch Ness. The photo is taken from a camcorder video, and is of poor quality. I have been criticised as incompetent for this. However, in my defence I would say the weather conditions were not good, the seals rarely spent more than a few seconds on the surface between dives, and frequently surfaced many tens of metres from their diving point.The unfamiliar camcorder was on loan to me, I had only borrowed it twenty minutes earlier, there were no instructions for its use and I was also in charge of a tourist cruise boat at the same time. During the clip a heron mobs the seals, which submerge to get out of its way. Camcorder record of unusual sonar trace - possibly a seal? 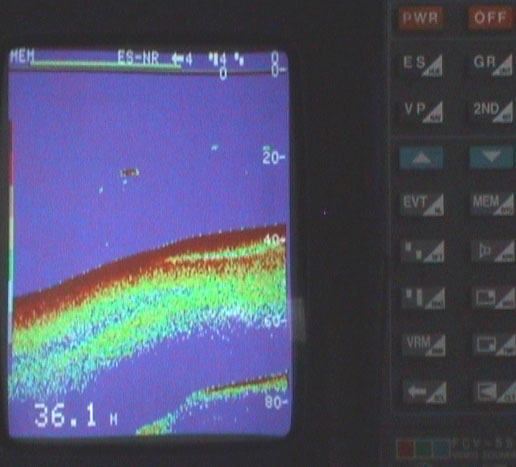 I managed to record the above sonar screen image during a cruise on board "MV Deepscan". It was about half a mile south west of Urquhart Castle, and close to the shore. There are a few typical fish traces in the vicinity. I have not worked out how long the object was within the sonar beam, but for the record, the boat would have been travelling at about 6 or 7 knots. video taken a few years later, posing as a monster with an open mouth.